By enabling better traceability of funds against specific assets, technologies should appeal to a significant segment of the lending market – one that is religiously conscientious. Such Islamic FinTechs should therefore be disruptive for the existing regime of Islamic financial services institutions who have problems managing credit risk and compliance. Islamic financial instruments are no stranger to controversy. It emerged from the scandals that gaining investor confidence for Islamic financial instruments such as the Sukuk, which is the Islamic alternative to bonds and securities, investors demand more transparency in Sukuk to make sure they are Shariah-compliant, thus making traceability to assets a special hindrance to current schemes of Sukuk. 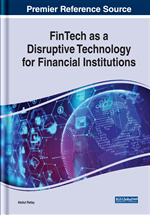 In this chapter, the authors will discuss how technology could be disruptive in Islamic banking and finance sector keeping Sukuk as a case. The authors will further elaborate on it by discussing the proposed model of blockchain that could solve the issue of traceability which could also boost investor confidence in Sukuk. The societal disharmony that results from a large income gap between the rich and poor is essentially what Islamic models of financing aim to alleviate. By eyeing a fairer distribution of risk and return between lender and borrower, such models focus on aiding the buying of assets on credit rather than directly taking out loans. Islamic financing, in spirit, is not about earning from loans but about helping people buy assets on credit or earn a profit from businesses. The authors believe that blockchain technologies can greatly facilitate the type of large-scale asset-funding required by modern businesses and developers of infrastructure. By enabling better traceability of funds against specific assets, these technologies should appeal to a significant segment of the lending market – one that is religiously conscientious. Such Islamic fintechs (what is fintech?) should therefore disrupt the existing regime of Islamic Financial Services Institutions (IFSIs) as they have problems managing credit risk and compliance. Islamic financial instruments are no stranger to controversy, with scandals such as those involving Dubai Islamic Bank, Invest Dar and Goldman Sachs to name a few. This suggests that Islamic Banks could also have spurious projects similar to their conventional counterparts. The authors believe that these controversies primarily arise from a lack of investor confidence in the compliance of an Islamic financial instrument to Shariah guidelines. In 2012, Goldman Sachs’ $2 billion Islamic bond programme faced a setback when it emerged that the Sukuk were not endorsed by Shariah scholars, hence making it a spurious programme that adversely affected investor confidence. The programme was also accused of being used to finance other non-Shariah programmes that involved the interest-bearing side of conventional finance - an accusation that was rejected by the bank, yet further damaged already waning investor confidence. With such scandals, it emerged that gaining investor confidence for Islamic financial instruments, such as Sukuk (pronounced su-kook’ – plural of sak) - the Islamic alternative to bonds and securities, is more challenging than for conventional bonds. Investors demand more transparency in Sukuk to make sure they are Shariah-compliant, thus making traceability to assets a notable hindrance to current schemes of Sukuk. This may also lead to questions such as whether technologies like blockchain could effectively rectify trust issues and also improve investor confidence in Islamic financial instruments. It is also worthwhile to mention that the current scheme of Sukuk financing requires the contract to be an operating lease rather than a finance one. As the authors build up their argument on the crucial role technology may play in upscaling the growth of Islamic financial institutions, it is important to first briefly discuss what Islamic banks do and how they are different from their conventional counterparts. In this chapter, the authors will discuss how technology could be disruptive in Islamic banking and finance sector using Sukuk as a case. The authors will further elaborate by discussing our proposed model of blockchain that could solve the issue of traceability and lead to a boost in investor confidence in Sukuk. Maturity: It refers to the final date of payment against any financial instrument. SPV: A special purpose vehicle/entity (SPV/SPE) is a “bankruptcy-remote entity” that is used to isolate or securitize assets and is often held off-balance sheet. It is also referred to as a “bankruptcy-remote entity” or “variable interest entities” since its operations are very limited. Mudarabah: It is a partnership contract in which one party provides the capital, whereas the other party (known as ‘Mudarib’) provides labour and expertise in running the partnership. Sukuk: A Sukuk is meant to be an Islamic certificate, similar to a bond in western finance. It complies with Sharia—Islamic religious law. Fintech: Fintech is financial technology applied in financial services helping companies to manage the financial aspect of their businesses including new software, applications, processes and business models. Lease vs. Purchase Agreement: The methodology is to find the after tax cash outflows for each year under both alternatives. Then look at PV using after tax cost of debt (since the choice is between two financing techniques having very low risk). Miner: Mining is a process of adding transactions to the large distributed public ledger of existing transactions which are known as the block chain. The person involved in mining is hence called a miner. Ijarah Sukuk: Ijarah Sukuk are certificates of equal value which are issued by the owner of an existing property or asset either on his own or through a financial intermediary, for the purpose of leasing it against a rental from the subscription proceeds. After subscription, the underlying becomes owned by the Sukuk holders. Riba: In Islamic banking it is known as charged interest. Exploitative gains made in trade or business under Islamic law. P2P Lending: Peer-to-peer (P2P) lending is a method of debt financing that allows individuals to borrow and lend money minus the use of an official financial institution acting as an intermediary. Peer-to-peer lending removes the middleman from the process, but it also involves more time, effort and risk than the general brick-and-mortar lending scenarios. Wakala Sukuk: Wakala Sukuk is a form of sukuk structure that originates from the concept of a wakala which means an arrangement whereby one party entrusts another party to act on its behalf. A wakala is very similar to an agency contract in which there is a Principal and an Agent (manager). A principal (the investor) appoints an agent (wakeel) to invest funds on principal’s behalf, into a pool of investments or assets and the wakeel lends its expertise and manages those investments for a particular period of time for profit making. In this type of contract, the principal agrees to pay fees to the wakeel for the services rendered. Hyperledger: It is an open source combined with efforts bent to advance cross-industry block chain technologies. Ijarah: Ijarah is a type of contract in Islamic finance. It is an ownership of the right to the benefit of using an asset for a particular period of time in return for a payment. Bearer Bonds: A fixed-income security that is retained and kept by the holder (bearer), and not the registered owner. Coupons for interest payments are physically attached to the security, and it is the bondholder's responsibility to submit the coupons to a bank for payment and redeem the physical certificate when the bond at maturity date. Wealth Management: It is a very specialized field of financial service that combines financial and investment advice, accounting and tax services, retirement planning fee and legal advice and one estate planning to the clients for a fee. Musharakah: It is an Islamic partnership for financing contracts used by Islamic banking. An agreement between two or more parties (Islamic bank and its clients) where they to contribute the capital in cash or kind. Debts are not accepted. The partnership is in equal or varying amounts to establish a new project or share in an existing one. Shariah Law: Shariah Law is a set of religious principles which form a part of the Islamic culture. More precisely, it is the law of GOD. In Arabic its literal meaning is a way or path.